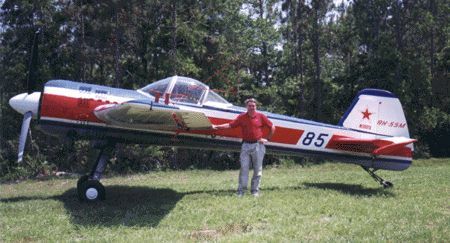 Yak 1001L with present owner, Larry Tague. Wanna buy it? One other thing. It's also a single-seater, so you get to learn how to fly it by, well, flying it. No dual checkout, unless the instructor wants to hang onto the wing for the flight. "There are a few interesting factoids - 1) there is no mixture control, 2) there is no trim control, and 3) it starts with a pneumatic air system which is not electric. Oh, and the gauges are in Russian, there are leather straps to keep your feet attached to the rudder pedals, and it's about as unergonomic a seating position as you can imagine." 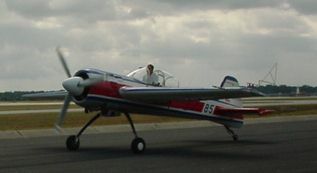 I flew this airplane quite unexpectedly - I had finished my aerobatic practice for the day and went over to hang out with some other pilots when the offer to fly the plane came. Of course, I took it! The pre-flight includes draining the oil from the bottom cylinders to prevent hydraulic lock when starting. Crawling up into the thing is an interesting feat to begin with - you've got to sort of climb backwards up the tall landing gear struts to sit on the wing, then you can walk over to the cockpit. You get the feeling of sitting very high up in the thing. There are a few interesting factoids - 1) there is no mixture control, 2) there is no trim control, and 3) it starts with a pneumatic air system which is not electric. Oh, and the gauges are in Russian, there are leather straps to keep your feet attached to the rudder pedals, and it's about as unergonomic a seating position as you can imagine. I'm a middle-sized guy, about 185 lbs. and 5'9", and my knees were poking up towards my chest - slightly uncomfortable, but it didn't impede my ability to get to all the controls. I'm sure that if I flew the plane a few times I'd get used to it quickly. So, here's how you start a 360hp supercharged Yak-55M. 5 shots to prime the engine. Rotate the primer to the left and pump it 5 more times - that's for the pump itself. Switch on the battery switch to 'on'. Switch on the mags to "1+2". Prop full forward and throttle to 1/4" open. Now all you do is mash the little starter button until the engine fires. Easy! No 3-handed juggling act like most of us are used to doing. Generator, instruments, radios, and compressor are now brought online. The idea behind the compressor is to re-accumulate enough air pressure for your next air start. However, this builds slowly so you need to watch a small air pressure gauge installed for this purpose as you taxi. Prior to 'red-line' on the gauge, you shut the compressor down. Piece 'o cake. Taxiing was no big deal. I'm used to a Pitts, and the forward visibility in the Yak was far greater than in my little rocket ship. The tailwheel only swivels 30 degrees in either direction, but other than that, very straightforward. I made small S-turns out to the runway. I noticed that one gets a lot of attention when taxiing around in this strange-looking bird. "I decided to try a loop, entering at 300 klicks ('30' on the ASI.) This time I passed the vertical without any problems (although I was much more careful with the rudder.) Right at the 3/8 mark of the loop as I was nearing inverted flight, it did it again, although this time the snap was a good 3/4 of a roll ending with the nose pointing downward and the telltale start of a power-on spin setting in." I had a pretty decent crosswind from the northeast (taking off runway 9L at SFB [Sanford, Florida], winds from 050 at 14 knots gusting to 19.) The big rudder made it easy to track the centerline on the takeoff roll. A slight aft pressure on the stick, and... whoosh! Airborne. Time to have some fun with this thing. The airplane climbs like a tractor - I'm not sure if it would outclimb my Pitts, but it was close nevertheless. I got out from under the class bravo shelf around MCO [Orlando International] and headed for my practice area northeast of the airport. I made a few turns and immediately noted the significant adverse yaw caused by the huge ailerons. It was harder to 'feel' the uncoordinated turn as I was sitting directly above the main wing spar, but after a few turns I sensed about how much I needed. In short order I worked up to 6G turns and was able to nail the altitude without so much as a burp from the altimeter. Time for some rolls and inverted flight. I mentioned earlier that the Yak has no trim or mixture controls. How, you ask? Well, the airplane is always automatically in trim. Russian simplicity - they built it into the very design of the aircraft. It was slick - the controls never felt heavy. Mixture was handled by a device which automatically compensated for altitude. This airplane was built for the harsh environment of the former Soviet Union, and it shows. Everything is rugged and built as simple as possible. I think I'll look further into how this system works - I don't really understand it. Time for some vertical maneuvers. The plane had been pretty gentle (although still 'rough' in feel) to me so far. Now it was about to show me some quirks in its behavior. I made a 3.5G pullup to the vertical with the intention of a hammerhead turn to the right (left-swinging prop, hammerhead to the right - opposite my usual routine.) As I pulled up I had the immediate sensation of flying a spinning gyroscope - which I quite literally was. The effects of gyroscopic precession, p-factor, torque, and whatnot are nothing new to student pilots, but boy did I feel it in the this plane! I used right rudder to compensate for the fastest rate of pitch change and started easing into left rudder as I drew my vertical upline. The plane started rolling in the vertical and I felt unable to stop it! I did a pretty ugly hammerhead (I hesitate to even call it a hammerhead) and tried to draw a nice vertical downline. Same thing on the pullout - right as I reached the 45 degree point the plane started wobbling again and then threw me somewhat violently into a quarter snaproll to the right. Heh! Cute. I called Larry on the radio to confirm the entry speeds - he told me anything over 250 klicks. I noted the '25' mark on the altimeter and decided to try a loop, entering at 300 klicks ('30' on the ASI.) This time I passed the vertical without any problems (although I was much more careful with the rudder.) Right at the 3/8 mark of the loop as I was nearing inverted flight, it did it again, although this time the snap was a good 3/4 of a roll ending with the nose pointing downward and the telltale start of a power-on spin setting in. I simply reduced power and the plane flew right out of it with no recovery needed. I tried the loop three more times, finally getting it right the last time. In the Pitts the required rudder input is very easy to sense, probably because the pilot sits so far behind the wing spar. In this plane, I really had to fine-tune my senses. I imagine it would be pretty easy to fly an 'avalanche' (loop with a snap roll at the top) in the Yak! This plane is truly a flying gyro. Every pitch change requires the pilot to be cognizant of precession and torque. I imagine that's due to the immense power generated by the powerplant. Finally, it was time to try a tumble. This is a maneuver which should only be attempted in an aircraft approved for such a manuever, which the Yak is. My Pitts is very tumble resistant - probably due to the bi-wing and draggy flying wires and such - so I was really looking forward to giving it a try. I made sure I had plenty of altitude and slowed down to 220 klicks, the recommended entry speed. Mashed the right rudder pedal to the floor, followed instantly by full forward elevator and full right stick deflection. Wooooohooooo! Better than Mr. Toad's wild ride. I probably did some combination of somersault and cartwheel. I have no idea how it looked from the ground, but that's how it felt in the air. Recovery was simply neutralizing the controls. VERY easy airplane to fly in that sense - get in trouble? Just let the plane fly itself out. I came back for landing and wouldn't you know it, the tower asked me to provide my airspeed on downwind. I was following (and catching up to) a Seminole in the pattern. I guesstimated my speed at about 100-105kts and told the tower so, and was told to make a short approach inside of the Seminole and a 727 on final. Okay, no time like the present, and no pressure to make a nice landing on the first try - ha! All in all, a very worthwhile and satisfying experience. I hope everyone gets a chance to try something like this - it is very exhilarating to be challenged by a new aircraft and have the confidence to fly it and learn it simultaneously! I feel like it was a very memorable event in my 'career' as a pilot.